They have 8 to 10 inch flower spikes. They are cold hardy to zone 7. My Victoria Blues don’t usually make it in my zone 7 garden here in NC. I am going to try and find seeds for this cultivar Victoria. Does anyone know where I can find the seeds? I haven’t done a search yet. You don’t have to dead head them and the northern zones let it go to seed in hopes of naturalization. 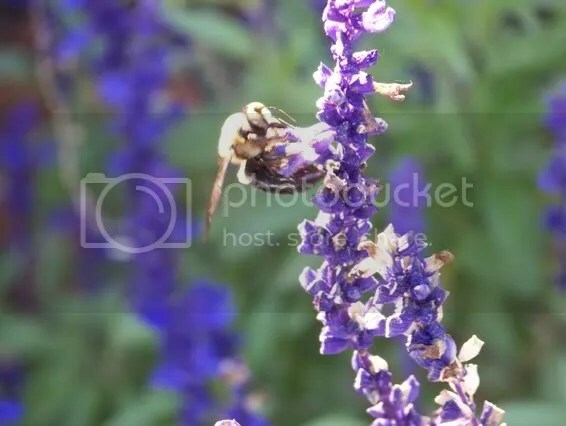 Salvias are butterfly, hummingbird, and bee magnets. But thank goodness, the deer are not too fond of them. They are disease resistant and drought tolerant. I just love them. Don’t you? Thanks forthe info and pictures. I had picked up this plant at a nursery and was trying to get idea of where to place in my garden. I get quite a few of these salvia names mixed up. Great photos! 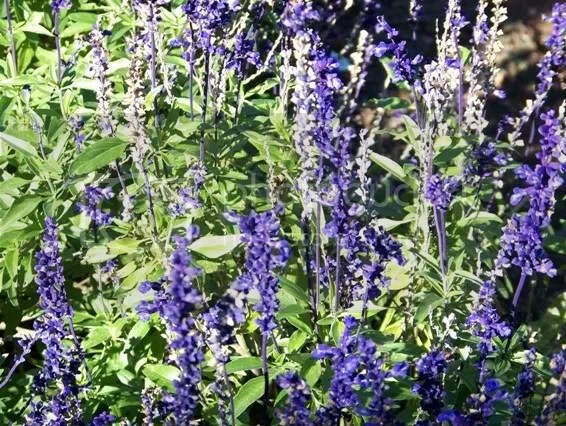 We just bought some Salvia Victoria Blue to add to our butterfly garden, here in zone 9. It has been blooming for weeks. Thanks for all the great tips and photos. I will go look up the blue chip plant as you suggested to see if it will work here. 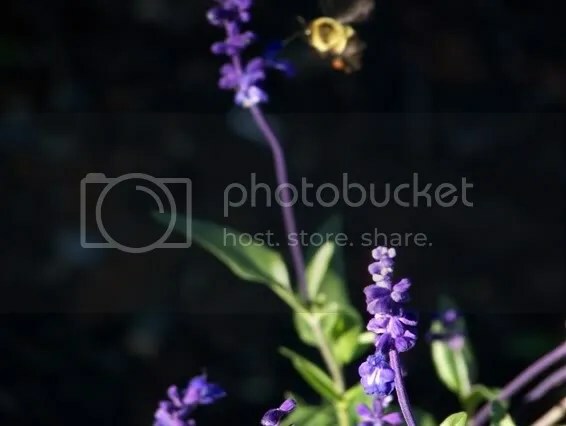 Victoria blue salvia are one of the kinds of salvia which looks really beautiful when bloomed. It will get big in your garden. You’ll know when it needs water cause the leaves droop. NC had one of the hottest summers on record and my Victorias did better than anything in the garden. I did notice that the root system is very fiberous so the beds need to have plenty of mulch. I bet your soil is sandy and will need lots of good dirt mixed in. Our soil is clay and needs leaf mulch. I’m just talking here….but I have heard you shouldn’t mix clay and sand cause with the right amount of rain….it makes concrete. The clay has the ingredients that also make sheetrock so when you add the sand and water……you make a bed of concrete. So you folks out there who have clay soil….do not add sand. I grew some in a pot two years ago and loved it. It’s not always easy to find in zone 5 but worth looking for. It would look good in a pot and I better write that down. I’m going to find it this year if I have to drive to California and back. Dee, Yes, there is a light blue, dark blue, and white. I didn’t like the white as well. It seems like white cultivars are less stable in my opinion. I guess I’ve moved to much to watch them reseed and perhaps the plants I put in this year have dropped a few as a present for giving them such good soil. Glad to know they do reseed as all the info out there says it does. Great photos. Salvias rock my world. Mine too! I have a couple of other salvias as well. I would like to get some Cleary Sage seeds. I’ve never been able to find the Cleary with the tips that change color. I saw them in a nursery once but not since. I’ve googled Cleary and can’t find the one I want. I’ll hit the farmer’s market in the Spring and see if I can find one. I grow the Victoria Blues too, and I love them. Some winters they overwinter in my garden (Zone 7, between Washington DC and Baltimore MD). Last year, all the plants I had made it through, but we had a mild winter. I don’t think any will make it this year as we’ve already had temps in the low teens. Anna, a beautiful salvia. I do like this genus of plants and keep getting more. Chilton seeds so Salvia farinacea Victoria so it must be a selection that comes true from seed. Thompson and Morgan have Salvia farinacea Fairy Queen which has blue and white bicoloured flowers – sounds nice. They also list it as easy from seed. I think you can buy from both of these companies in USA. It is on my wish list!! I have another guest post on http://www.tulipsinthewoods.com which may interest you. Thank you Sylvia for the information. The dark blue is hard to find and is sometimes confused with the lighter blue. 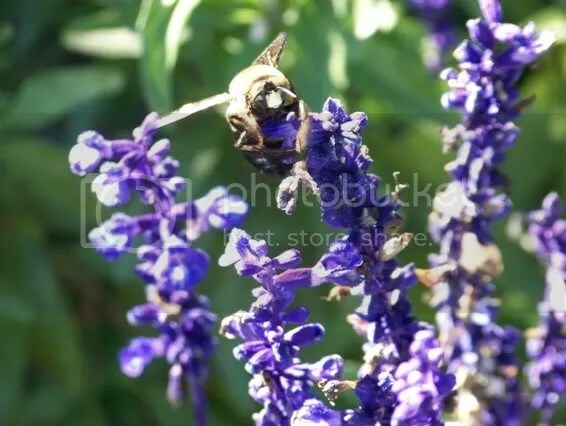 Lovely Pictures of your salvia – they are such a great plant to have in the garden. I find lots of salvia for sale but this dark blue is rare. I know of only one nursery around here who carries it and they don’t have it every year. I love blue flowers and Salvia grows generally well over here. Salvia is a versatile group, the red ‘Blaze of Fire’ is a fantastic bedding plant. I’ll have to look for the Blaze of Fire. I can see how pretty they would be with some yellow mixed in. I get so caught up in color and love it so much. Usually you can’t get seeds of a cultivar. A cultivar is created by “cloning” a single plant that has especially great characteristics, i.e. taking cuttings. At least that’s the way I have heard the word used. It is very beautiful, why not just take a cutting of your plants in the summer and over winter it inside? Are those photos from your garden? Thank you for stopping by and nice to meet you. Yes, they are pictures from my garden. And thank you for asking! I am grateful for the information on the cultivars and I agree with you. I sometimes test plants for Proven Winners plants and they grow only cultivars. But at about.com, it said they would reseed. I would think that meant we have one that is a hybrid don’t ya think? I have great success with Autumn sage and lyre leaf sage. One is pink and the other is blue. I need a pink one. You just can’t go wrong with the salvias in my opinion. I do love sage/salvia. I have several kinds in my garden each year. Some annual and some perennial. Your ‘Victoria Blue’ reminds me of lavender. Good to see you Robin— It does remind me of lavender. I would love to plant the soft blue of Spanish lavender with it. The dark and light would be pretty together wouldn’t it? I love your pictures. I’m always looking for new flowers to put in my butterfly garden. Thanks for sharing. Thank you so much for visiting my blog. My favorite plant this year for butterflies is a little butterfly bush called Lo and Behold Blue Chip by Proven Winners Plants. It stays small like about 3 feet and has beautiful blue blooms on it all season long. The butterflies just love it.